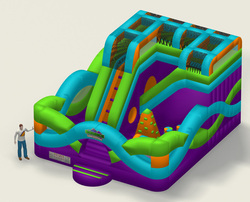 Bounce Milwaukee's inflatable sports arena is anything but a backyard bouncy castle. Click for a list of some of the sports and activities we offer. 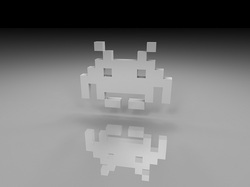 To find out what's in store for your visit, or to suggest a game, just give us a call or stop by. 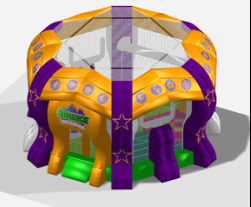 Bounce Milwaukee's two level laser tag arena encourages teamwork and cooperation. It features over 20 different game modes to choose from, and the world's first Helios system. 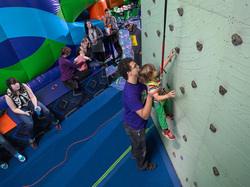 With routes ranging from child-friendly to extremely challenging, Bounce Milwaukee's rock climbing walls are paired with TruBlue autobelays for an experience as safe as it is exciting. 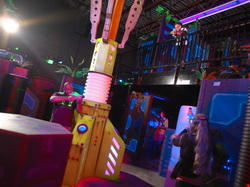 The Adrenaline Zone combines many elements into one complex, challenging to kids and adults alike. Identical paths on either side lend themselves to obstacle course contests, too. 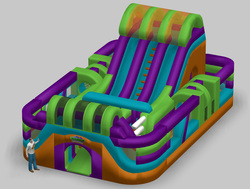 Plenty of climbing and bouncing space? Check. Big slide? Check. Pop-ups and portholes? Check and check. The Moebius even has a smaller climbing structure for those practicing to reach bigger heights. The Blue Room is a room full of Imagination Playground blocks. Perfect for forts, sculptures, or open-ended play for kids (and adults) of all ages. Ten pinball machines, Galaga, Ms. Pac-Man, Gauntlet, Space Invaders, Dig Dug, and many, many more - all included free with any admission. Click on the picture for a (nearly) complete list. And don't forget the air hockey! Our climbing structure includes two different slides, and tons of space to explore. Our ball pit includes a spinning UFO, with controllable music, and a trap door which releases balls. Fling Milwaukee is a separate axe-throwing attraction located within our complex. Click for more details!